Editor's Note: Today I am wearing a J.Crew linen dress, Monaco leather belt and J. Crew sparkly flats. I decided last week that every Monday my blog is going to be what interested me on Instagram that weekend. I follow a lot of people so I have many images to choose from. What I tagged this weekend range from interiors to art to anything that I thought was beautiful. I did a little retail therapy on Friday and found the cutest bathing suit at Anthropologie that was two-pieces. I was shocked and delighted that I looked cute in a two piece bathing suit for the first time in since my twenties. Come on readers anyone who wants to learn my mid-life secret please email me! I would be glad to share! Here are my images that I liked on Instagram this weekend. Happy Monday everyone! I love Mondays--it is the beginning of the week and it is full of opportunities! My stinky cute if I do say so myself new bathing suit!! It even goes with my hat that still belongs to mother but adorns my head every weekend! Love this quote! There is more to life than just money! I love this piece of art. Love the colors!! I have had this room in one of my blogs before. I still think it is gorgeous! Piazza Navona in Rome is one of my favorites! The local artist display their art their and I bought several pieces. So much fun!! Love this moment for reading and visiting. Fabrics are great! Is this not the prettiest street you have ever seen? I think I am having Greece envy! Cool piece of art! Since this Instagram speaks a totally different language than I do if I ever want to buy from the artist it will be a challenge! I am hoping to buy this for my Palm Springs project! Gorgeous flowers! Truly God's beauty! Love this bathroom--art included! Very elegant! I think almost everything about London is classy! All I can say about this photo is ahhhh! What a fabulous explosion of color!! Steel Magnolia Tip #3: When you have made a mistake or screw up--say you are sorry and move on. Leave the old baggage on the curb where it belongs. Last night for dinner I had zucchini soup, tenderloin filet, and arugula salad with Swiss cheese. Delicious! 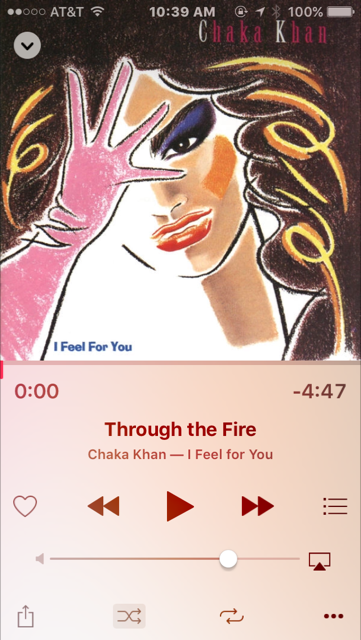 I never go tired of this Chaka Khan song from the 80's. It still makes me break out into song! !